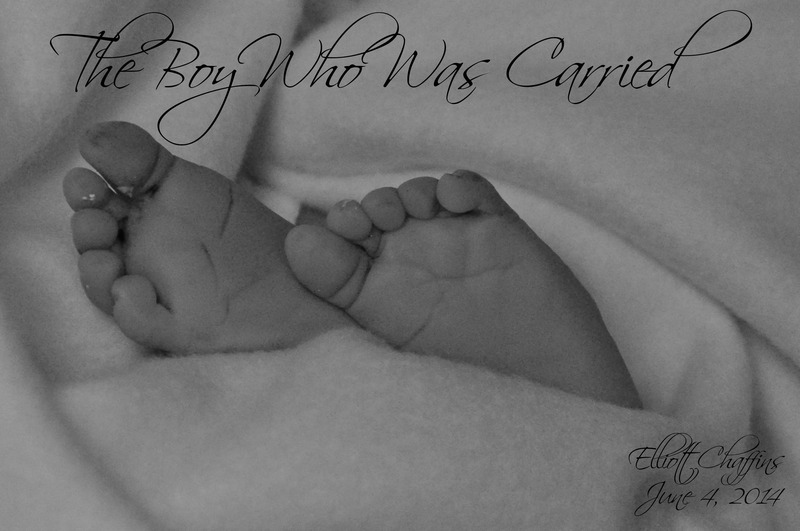 You are the boy who was carried. For 35 weeks (give or take), you were nestled inside of me. At first, there was fear, but as you grew, my fears receded. Rather than seeing you as a source of shame, you became a symbol of love. I carried that love with me during the times when I felt alone and it sustained me, even as my body sustained you. As you were carried by me, you were also carried by your father. You heard his voice, and calmed at the words he spoke to you. You were held when he put his hands on my swelling form, caressing the both of us. You were carried by the imaginations your siblings as they laughed about various milestones that would be reached, things like driving a car when you were born, or graduating college when you were entering kindergarten. They nicknamed you “bruster” – the brother/sister that they were awaiting. We sat in a tiny room while the doctors searched methodically for your heartbeat, but that part of you was already gone. Family came to surround us as you were carried by medicine and cries and pain from my body, into our arms. We carried you, all too briefly, in our arms. Cradling your delicate body, running fingers over your face, hands, feet, torso, trying to memorize every detail, knowing that would be an impossibility, but trying nevertheless. You were bathed in tears and whispers of love. You are carried still today. We carry the weight of memories that will never be. We carry the loss of tickle fights and frosting smeared across your face and presents abandoned for the wrapping paper. We carry the loss of first days of school and countless graduation ceremonies. We carry the loss of first loves and first heartbreaks. We carry the loss of bad puns and serious discussions and all of the ways children talk to their parents. We carry the grief that can overwhelm us with no warning. Every day we carry you with us. The joy and the sorrow. The love and the pain. Every day we carry the life that was and the life that was not. We miss you, sweet Elliott. Today we celebrate you, the boy who was, and always will be, carried. This entry was posted in Grief and tagged birthday, death, grief, stillbirth. Bookmark the permalink. Beautifully written and very touching. It made me think of my younger sister who lost her son Ryan after a few months of life, and who just lost her daughter Noelle last year. They always hold a place in the heart, so they always live in the mystery we call Love. My friend, Cerise Patron, lost her son, Mateo, as she was about to give birth-he went still. I will pass your post on to them. Thank you!! Alise – this is beautiful, just like you, just like the love you and Rich have. As I sit here in tears know that over the next few days I will be carrying you through with prayers! Can’t wait to meet you Elliot!